ICHNO, Barcelona · 2019, C. Hoffmann et al. Purpose/Objective: Hafnium oxide nanoparticles, NBTXR3, were developed to augment tumor-localized high energy deposit once activated by ionizing radiation such as Intensity Modulated Radiation Therapy (IMRT) and thus to increase tumor cell death compared to the same dose of radiation. NBTXR3 is characterized by a single intratumoral (IT) administration and fits into standard radiotherapy schedule with no change in patient’s care pathway, treatment protocol or equipment. A phase I trial is currently evaluating NBTXR3 in elderly patients (pts) with locally advanced head and neck squamous cell carcinoma (HNSCC) of the oral cavity and oropharynx not eligible for cisplatin or intolerant to cetuximab [NCT01946867]. Material/Methods: In this phase I open-label, non-randomized trial, elderly frail pts (65 years and older) were treated with an IT injection of NBTXR3 followed by IMRT (70 Gy in 35 fractions over 7 weeks) with a follow-up period until disease progression or study cut-off date. The study was designed as a 3 + 3 escalation dose with tested NBTXR3 dose levels at 5%, 10%, 15% and 22% of baseline tumor volume. Primary endpoints included the determination of recommended dose and early dose limiting toxicity (DLT). Presence of NBTXR3 in the surrounding healthy tissues and efficacy as per RECIST 1.1 tumor response were also evaluated. Results: The inclusion was completed at all dose levels 22% (7 pts), 15% (5 pts), 10% (3 pts) and at 5% (3 pts). All patients that completed the DLT evaluation period did not present any early DLTs or serious adverse events (SAEs) related to NBTXR3 or the injection procedure. So far, two AEs (asthenia, grade 1; pain, grade 2) related to NBTXR3 were reported in patients at the 22% dose level. Additionally, four AEs related to the injection procedure (tumor hemorrhage, grade 1; oral pain, grade 2; asthenia, grade 1, hemorrhage, grade 1) occurred in patients at the 15% and 22% dose levels. Conclusion: NBTXR3 was well tolerated even at the highest dose with an overall positive safety profile. As the last dose level was reached, a dose expansion group will start in this clinical setting once the recommended dose is identified. These results open a promising perspective in frail HNSCC pts with advanced age, which is a population not often evaluated in clinical trials. 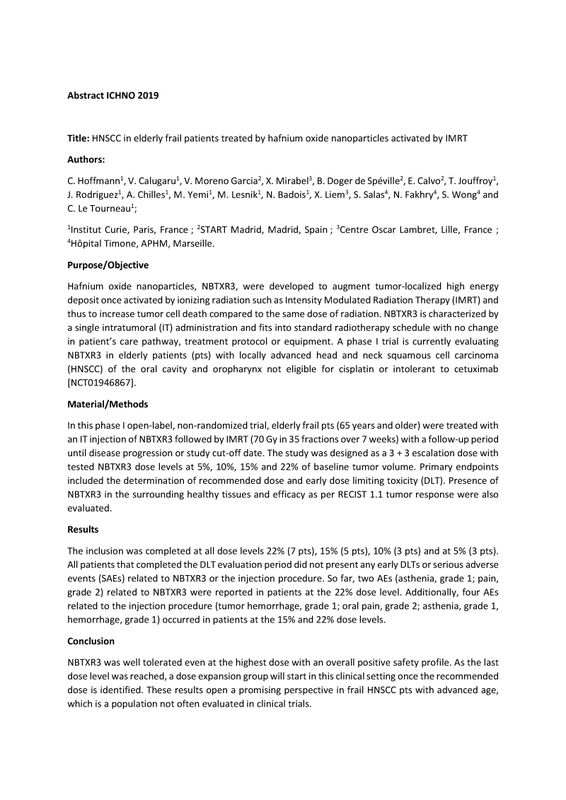 NBTXR3 was also evaluated in a phase II/III clinical trial in soft tissue sarcoma [NCT02379845] with positive results and is currently being evaluated in prostate cancer [NCT02805894], liver cancer [NCT02721056], rectal cancer [NCT02465593] and recurrent/metastatic HNSCC or metastatic non-small cell lung cancer [NCT03589339].